When I am actively making positive changes in my life or trying something new, I like to read inspiring books to keep me engaged and help to either shift my mindset, or support my efforts. Simplicity has been at the core of every major change I’ve made, from food to clutter to debt to creativity, productivity, and doing work I really believe in and care about. I purchase books to support authors and to feed my soul, and then I pass them on (unless I’m reading them on Kindle). If I want to read them again, I get them from the library. The books that changed me. These books have all made a difference in my life. They’ve changed me, or helped me change me. They helped me to try something new, think about things in a new way, or simply encouraged changes I was making. Many of the them are written by friends, which makes them even more enjoyable. 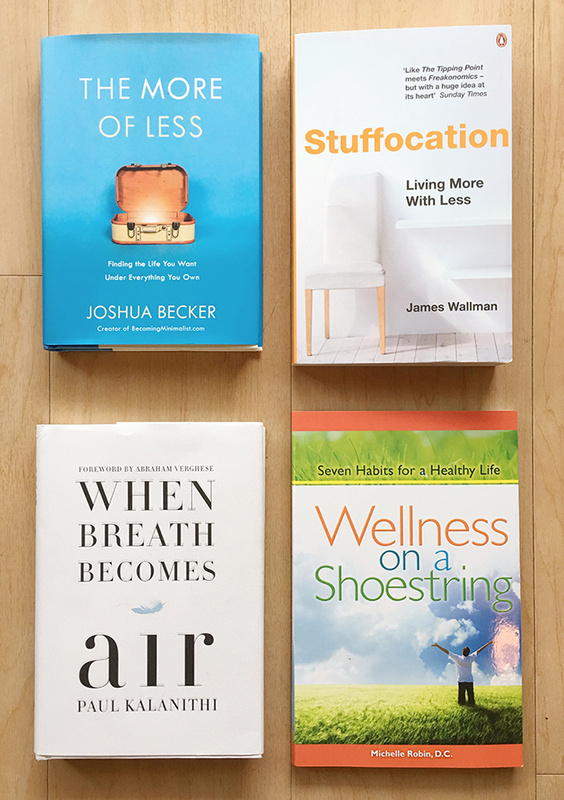 The first 2 books in the list below have just become available, but I was lucky enough to receive advanced copies and highly recommend them if you are in the beginning stages of decluttering your life, or if you are finding your way back to simplicity. Francine Jay shares simple steps to cultivate a minimalist mindset and form new habits, paving the way to lasting success. Her easy-to-follow STREAMLINE method works in any space—from a single drawer to a closet, room, or entire house. What’s more, it can be called upon during clutter-inducing life events such as moving, getting married, having kids, or downsizing. This book really planted the seed for me that the life I craved would be found in less, not in more. In Your Money or Your Life, Vicki Robin and Joe Dominguez show readers how to gain control of their money and finally begin to make a life, rather than just make a living. The author of this book, Tammy Strobel is a close, personal friend and I hope she’ll be joining me on a few of my Tiny Wardrobe Tour stops. She has a powerful story and a very tender way of sharing it in You Can Buy Happiness (and It’s Cheap). This book will help you say no, and remind you to choose what matters most to you in work and life. Use Marie Kondo’s powerful question, “Does this bring me joy?” to let go. I’ve done the Whole 30 Challenge twice and have shifted the way I eat as a result. I’m planning another official 30 day challenge in June. Check out the book if you want to join me. Authors, Joshua and Ryan are out on tour now with Minimalism, A Documentary about the Important Things. You can see if they are coming to your city here. This book changed the way I think about money. It offers a simple, common sense approach to pay off debt and build wealth. I’m reading Chris Guillebeau’s newest book now, and speaking briefly at his book tour event in Salt Lake City this weekend. Learn more about the book and event here. I listened to this book as author Elizabeth Gilbert reads the audio book version herself. If there is creative work in your heart that you want to bring to life, this is a must read. The 3 books I’m reading next. I’d like to start reading one book a week alternating between non-fiction and fiction, but these are the three books I’m reading next. Author, Dr. Michelle Robin recently interviewed me for her podcast, Small Changes, Big Shifts and we hit it off right away. She sent me a copy of her book, and I can’t wait to dig in to her brilliant advice. She will also be hosting the Tiny Wardrobe Tour in Kansas City at her Wellness Center. You can hear our chat here. Stuffocation is a movement manifesto for “experiential” living, a call to arms to stop accumulating stuff and start accumulating experiences, and a road map for a new way forward with the potential to transform our lives. I’m about 45 pages into this beautiful memoir, but I put it on hold while I was traveling recently. I didn’t want to be on an airplane or somewhere unfamiliar while experiencing this moving story about Paul Kalanithi, a neurosurgeon diagnosed with stage IV lung cancer. I have loved Goddesses Never Age by Dr. Christiane Northrup and You Are the Placebo by Dr. Joe Dispenza. Both have had a huge impact on my state of mind and overall happiness in conjunction with practicing minimalism. I am constantly baffled by the Marie Kondo book on lists like this. I’ve read it and found it to be a complete waste of time. Keep things that spark joy. Yes. Good tip. The rest of it? Just… why? Karen, I know what you mean. Sometimes though, such a simple (and, in my experience, powerful) idea needs to come wrapped up in lots of pages and a cover to really sink in and have an impact. If you read her second book, the first book makes more sense. She goes into more detail and explains herself and her method more clearly. I found the emphasis of creating beautiful spaces to be helpful. And also the idea that items you haven’t used yet (for me it was unread books) have possible already played their role in your life. I think the Marie Kondo book has done so well because she give “permission” to people to let go of stuff they’ve been holding onto out of guilt. Not all but some people need permission to let go. I like the Minimalists’ question “Does it add value to your life?” better than “Does it spark joy?” My paring knife adds value to my life. It is a great tool in the kitchen, but it does not spark joy. My mother’s vase sparks joy every time I use it. Therefore, it adds value. However, my mother’s hand knit afghan sparks joy if and when I see it at the bottom of the blanket chest, but it does not add value. I haven’t used it in years. I will give it away. I don’t need it to remember her knitting talents. I agree, Karen. I think both Francine Jay’s “The Joy of Less” and Joshua Becker’s “The More of Less” are far better books; more useful and more inspiring, especially Joshua’s. I found the Kondo book really, really, really basic. Don’t mean to sound like a simple living snob, because I’m really not, but I do have to wonder why this kind of book hit the high mark. Great list! I have read many of these… I love the auido version of big magic and tidying up. A lovely lesson in gratitude and simplicity is the Little House on the Praire series. I also like the web-site Un-Fancy, Trash is for Tossers, and Zero Waste Home for inspiration. Thanks, Courtney and friends, for your recommendations! I am currently rereading Mark Nepo’s Seven Thousand Ways to Listen and making some new connections. Ohhh… I would love to win a book for you to send across the world to my beautiful little land of Sweden 🙂 I also give away a book after reading. But mostly I borrow from the library. The Joy of Less was life-changing for me! It put into words what I had already been feeling about all the clutter in my life and changed the way I look at many material possessions. Great list — thanks for the reading suggestions! I just added these books to my Goodreads list:) Thanks! I’ve read a few of these on your list, and am reading Joshua’s book now. I read Essentialism earlier this year (first book of 2016) and was blown away by its message. I will definitely revisit the book in a year or two and am considering buying it so I can reference it regularly. Also…I loved my Whole 30 experience and am gearing up to do another one soon. Thanks Courtney for another great post. I appreciate you not holding onto the books after you read them – what advice would you give to those of us who read to not only be inspired but also to learn and grow. I want to live more lightly yet find I seem to need to hold onto certain books when they contain a message I really need to hear and integrate within me. If I gave the books away like you, I’m not sure I’ll shift in my habits or remember what the book taught me. Do you ever take notes or scan pages in that you really find significant? Keep what really matters to you. I can give away clothes, kitchen gadgets, and trinkets — and some books — but the books I truly love have to stay! I’m like you in that I refer back to them at different stages in my personal and spiritual growth. I read The Life Changing Magic of Tidying Up a few weeks ago and have become hooked on decluttering, downsizing my wardrobe and starting Project 333. I’ll add all of these to my must read list, thanks for the recommendations!